Heading off to Camp Kitten! OK, it’s November, but so what? We’re going to camp anyway. MomCat has sewn the little labels onto the collars, and the carriers are all packed with blankies, toys and treats. They’re off to Camp Kitten at PetSmart in the bus, singing “99 Bags of Catnip on the Wall” as loud as they can yowl! 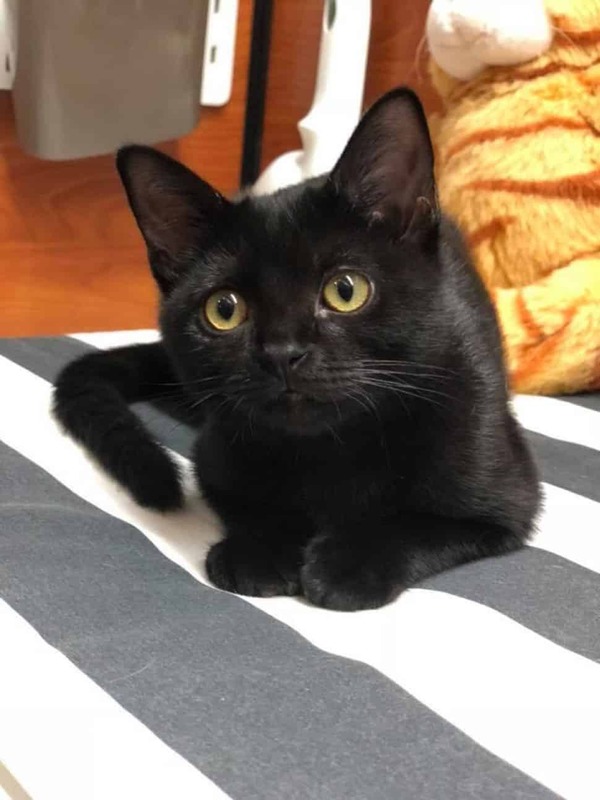 Helen Sanders CatPaws is featuring myriad moggies that will be engaging in crafts such as shredded feather toys, doing little dances around their play areas, and generally charming everyone. They’re kittens, after all. Each of these little kits has been bunking with an experienced foster and is ready to socialize. They’ve all been spayed or neutered, given their shots, and been thoroughly vetted. They can’t wait to go home from Camp Kitten—with you! Here are a few happy campers, photographed by CatPAWS’ official volunteer photographer, Eden Amans. Even at the camp canteen dances, Tony wears his tux proudly. He’s 3 months old and not in any way overdressed. Beautiful Inez! 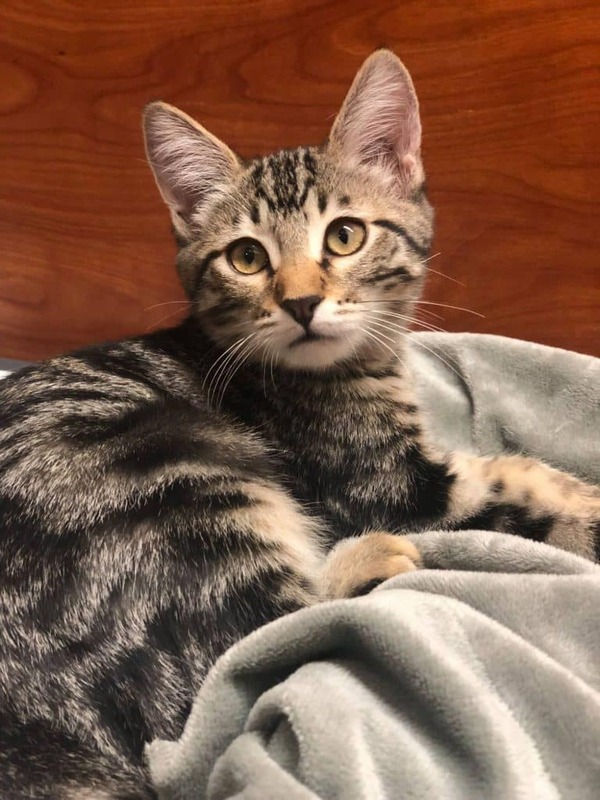 This loving kitten, only 3 months old, was alone in an overpopulated shelter and was scheduled to be euthanized when CatPAWS rescued her. Inez is so sweet and has the best purr. She’s off to camp, where she’ll await a cherished life! Adele is one of the most beautiful cats ever featured here. Of course, I’m a sucker for brown tabbies. Are you? Adele’s only 3 months old and is the perfect snuggler ’round the campfire. 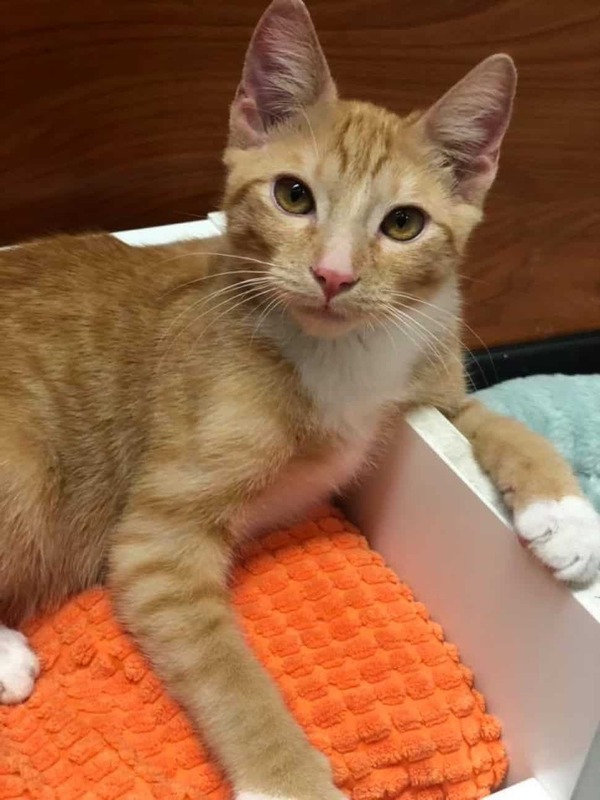 Camp Kitten will be held at PetSmart, 12341 Seal Beach Blvd. As with all the rescues featured in Pet Projects, CatPAWS is volunteer-run and also runs on donations. Visit this link to donate. 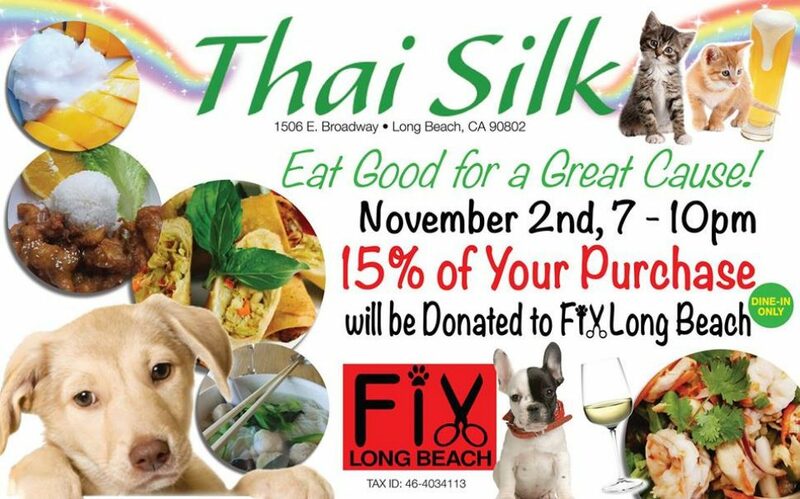 Thai Silk restaurant fundraiser for Fix Long Beach: Friday, Nov. 2, 7–10 p.m., Thai Silk, 1506 E. Broadway, Long Beach. Menu prices vary. Spice up your evening with a delicious Thai meal and know that 15 percent of the tab will go toward free spay/neuter procedures at Fix Long Beach Clinics. 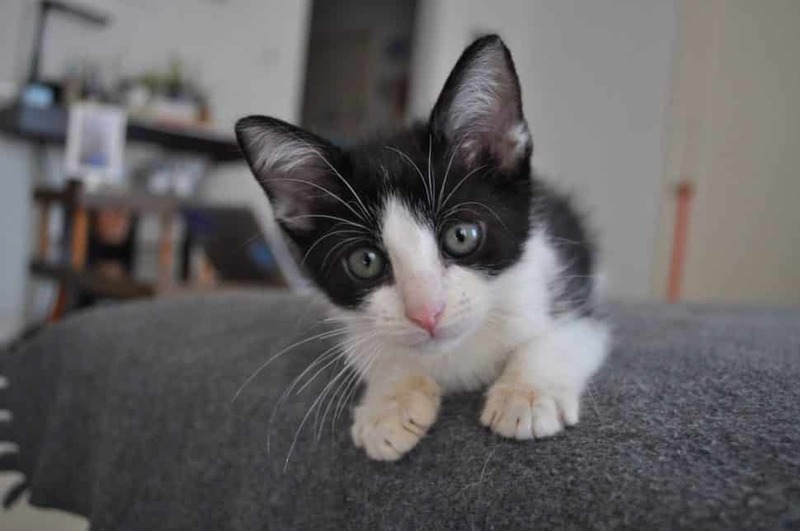 Helen Sanders CatPAWS’ Camp Kitten: Saturday, Nov. 3, noon–4 p.m., PetSmart, 12341 Seal Beach Blvd., Seal Beach. Adoption rates vary. Join us for Camp Kitten, the best day camp anywhere! Our kittens are ready for s’more fun! They can’t wait to explore the big world and find their forever families! You can also pick up one of the Show Us Your Kitties calendar, featuring CatPAWS paw-lumnae! 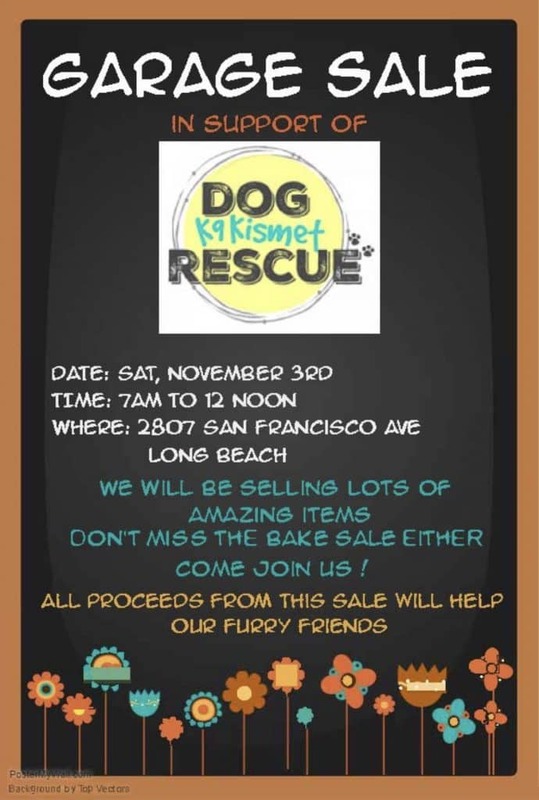 Super-Mega Garage and Bake Sale to benefit K9 Kismet Rescue Dogs: Saturday, Nov. 3, 7 a.m.–noon, 2807 San Francisco Ave., Long Beach. Item prices vary. Coolest stuff for sale: furniture, pet items, clothing, tools, kitchenware, home furnishings, vintage items, and on and on! Yummy baked goods and coffee to energize you while you look and buy! The best part? All proceeds will support the K9 Kismet pups, a couple of whom may show up and go home with you, too! Bring friends and family! 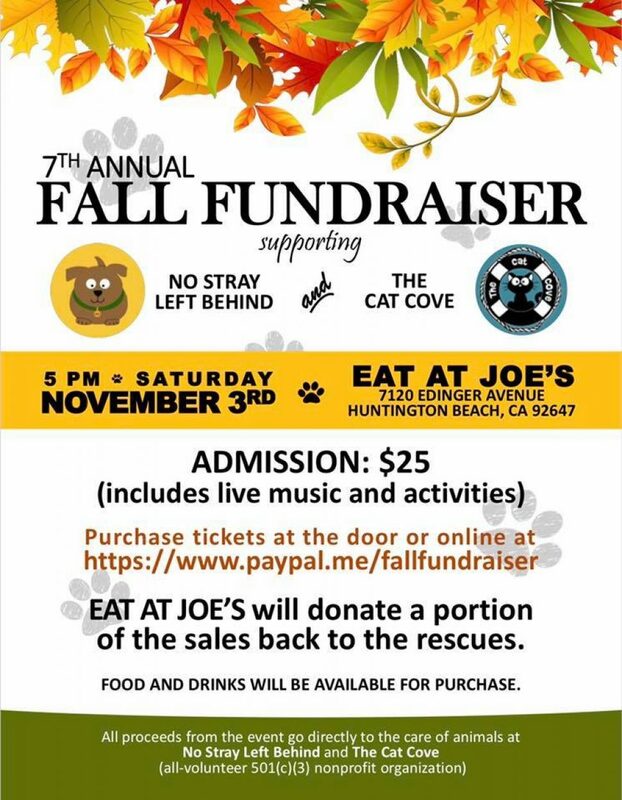 7th annual Fall Fund-Raiser, to benefit No Stray Left Behind and The Cat Cove: Saturday, Nov. 3, 5 p.m., Eat at Joe’s, 7120 Edinger Ave., Huntington Beach. $25 admission, menu prices vary; see flyer for details. 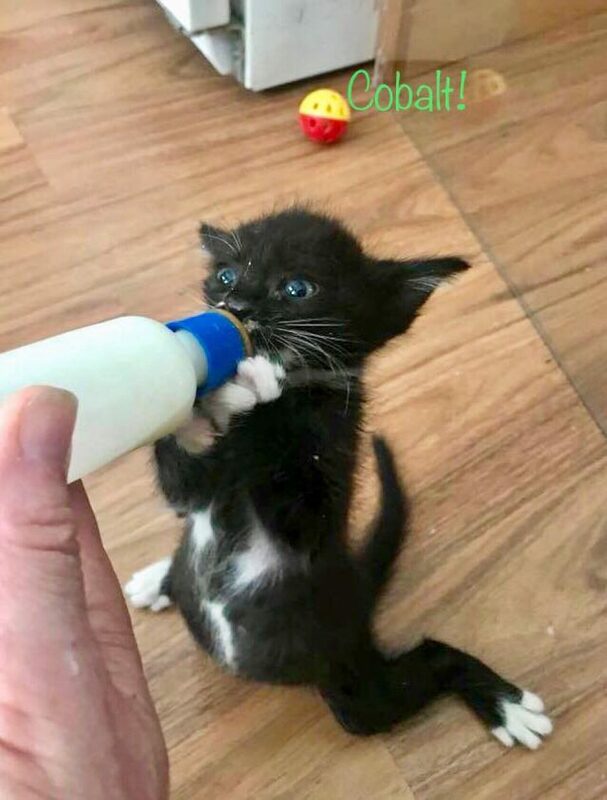 Dogs fostered through No Stray Left Behind and cats curled up at The Cat Cove want your attendance at this fund-raiser that includes live music, a menu of food and activities. Eat at Joe’s will also donate a portion of food and drink sales to the rescues. Join Friends of Long Beach Animals (FOLBA) at the Long Beach Veterans Day Parade: Saturday, Nov. 10, 10 a.m., Houghton Park, Atlantic Avenue between 55th and South streets, Long Beach. Free event; dogs welcome. 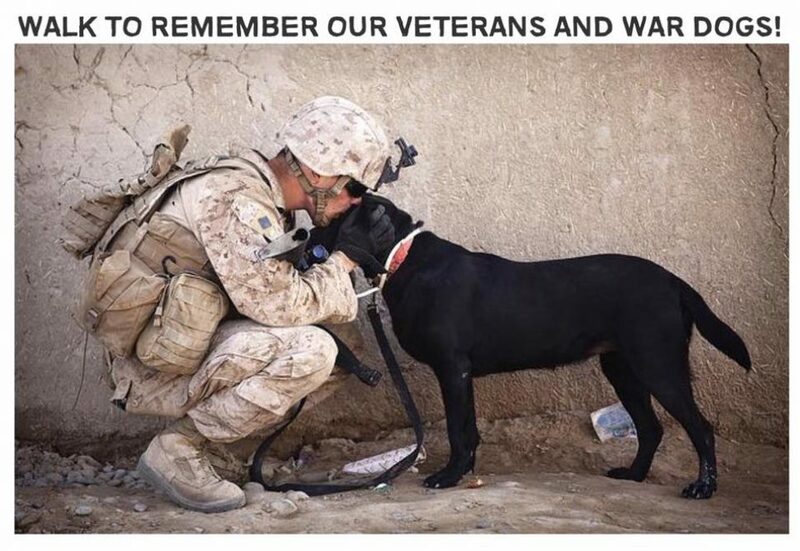 You are invited to march with or without your dog to help FOLBA honor and appreciate the Veterans and Canines who have fought so bravely to give us our freedom. Well-behaved and licensed dogs are welcome to join in—keep in mind that there are loud bands, cheerleaders and horses. Volunteers encouraged to bring shelter dogs up for adoption. For information, text (562) 881-5156. Inaugural Puppers Catsino Turnaround Fund-Raiser: Saturday, Nov. 10, 10 a.m., Green Line Station, 12901 Hoxie Ave., Norwalk. $50 donation per seat. Long Beach rescues The Little Lion Foundation and Live Love Animal Rescue team up with foster-care organization FARSide Journey for a fun run to Harrah’s in Rincon. Enjoy raffles and games on the bus and five hours in the casino. Proceeds go to the rescues. 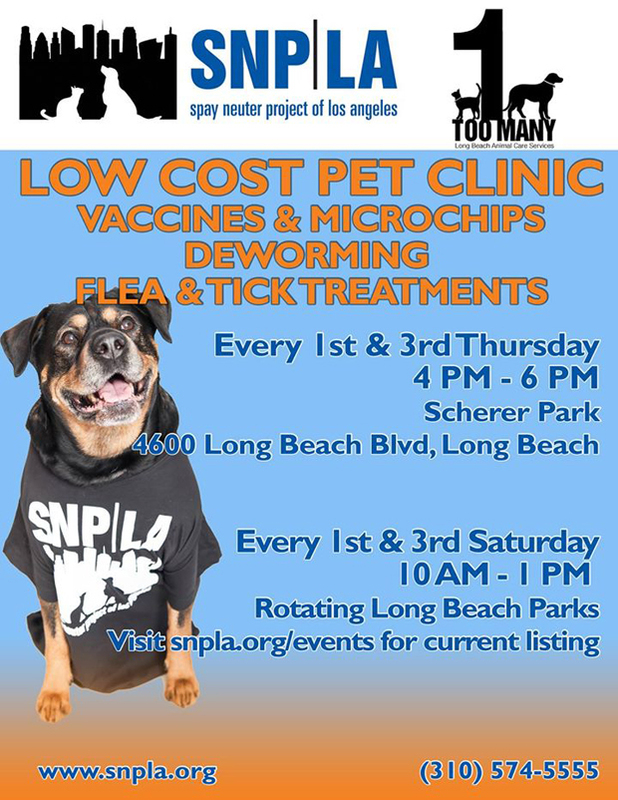 Fix Long Beach Free Spay/Neuter Clinic: Saturday, Nov. 13, 9 a.m.–3 p.m., Ramona Park, 3301 E. 65th St., Long Beach, free spay/neuter for qualifying Long Beach residents; free microchips; shots, flea-med doses, dewormers and nail trimmings $10 each. 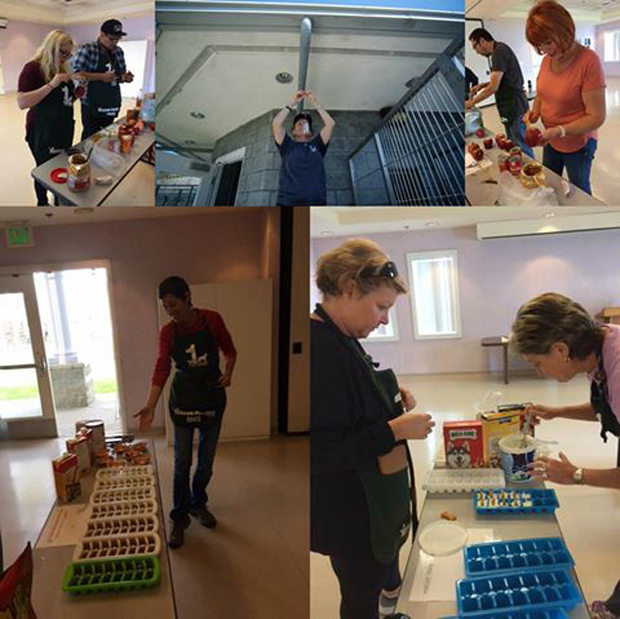 The Pet Food Bank is sponsored by Christian Outreach in Action, located at 515 E. 3rd St., Long Beach. 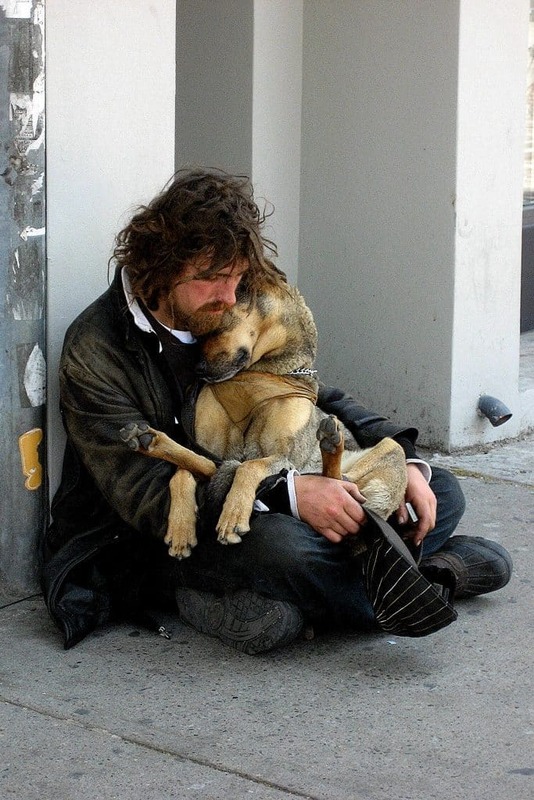 Hours are Thursday from 9 to 11 a.m.
Pets of the Homeless provides many collection places across the country to help homeless people to feed and care for their animals. Please support them through a cash donation, or bring pet food to the Long Beach-area drop-off center, Trendi Pawz Grooming, 3726 E. 7th St, Long Beach. Access this link for resources and donation areas in SoCal and across the country.